BROOKLYN, Ohio — The 2018 Baron Cup-champion Rocky River Pirates hopped over the boards and into their defense of their hardware on Thursday evening. The No. 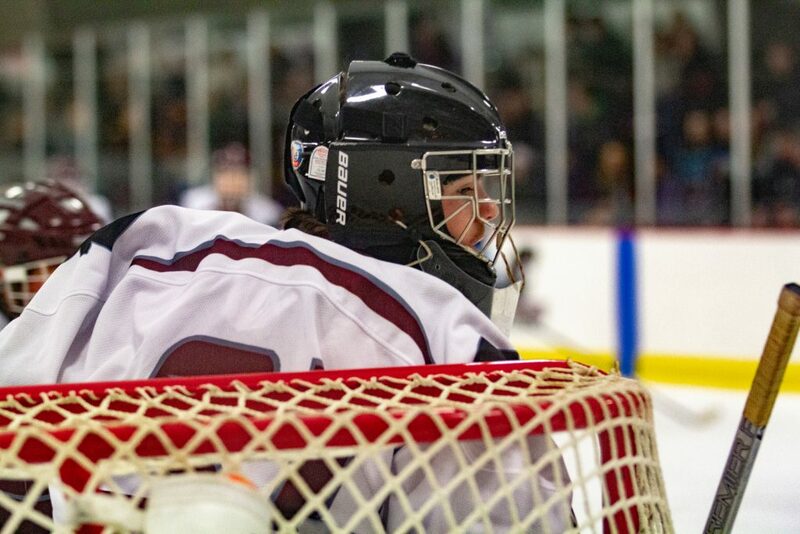 2-seed in the 2019 iteration of the Greater Cleveland High School Hockey League’s eight-team title bracket bashed the No. 7 Benedictine Bengals, 7-1, at the Brooklyn Recreation Center. Snapping a two-game losing streak, the Sons of Blackbeard dominated possession of the six ounces of vulcanized rubber to the tune of out-shooting the Bengals, 41-16. 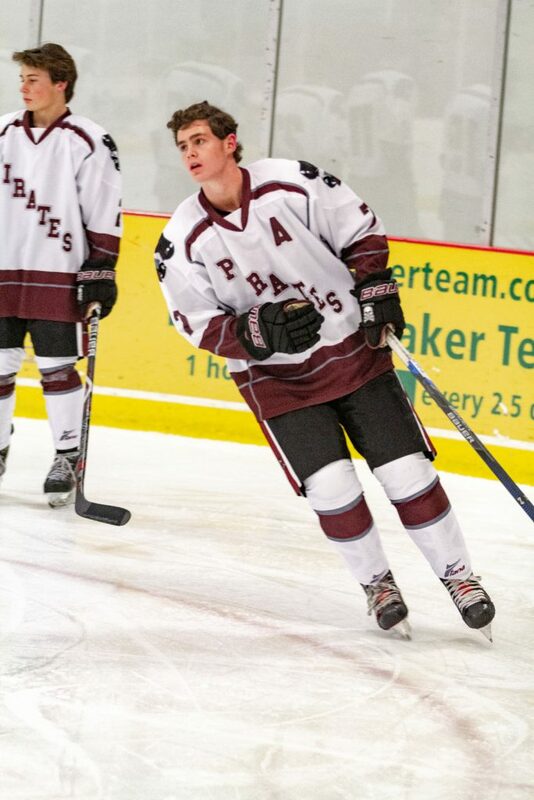 Hayden Weaver, Ethan Routenberg and Danny Asmar had multi-point games for Rocky River, which now advances to the semifinals of the 49th annual Cleveland high-school hockey tournament. Outmanned in numbers, the Bengals (11-13-1) were on their heels at the outset of the game, with the Pirates possessing the puck early and often and with skill and purpose. Rocky River (16-9-4) turned that possession time into a goal less than two-and-a-half minutes in when senior defenseman Ethan Routenberg fired a low-wrister cage-ward from the left point. Sophomore winger Hayden Weaver tipped the puck past the Benedictine goaltender to give the Pirates a 1-0 lead at the 12:35-mark. Making a return from injury and not to be outdone by his younger brother, it was senior captain Nolan Weaver who scored River’s next goal. The elder Weaver’s marker — at 11:32 of the first — came on a wrister as he cruised between defenders in the slot. Bouncing back nicely from being crushed against the sideboards a couple minutes prior, defenseman Matt Stueber assisted on the second River goal. A pair of Stueber’s blueline mates produced the next score of the game, three-and-a-half minutes later at the 8:02-mark. Goal No. 3 came on a slapper rifled off iron and into twine by Routenberg. Tommy Kelly provided the assist. Outshooting the Bengals, 12-4, Rocky River went into its locker room leading, 3-0, after the first. Benedictine didn’t land its first shot on goal until the 3:56-mark. That shot was sticked away by junior netminder Ethan Mylett, who would finish the game with 15 saves. Hayden Weaver’s second of the game — off a nifty swagger move through traffic and into the low slot — came on an Alex Parnell assist. The goal at 12:56 of the second extended the Pirate lead to 4-0. The advantage was upped to 5-0 on Luke Witzigreuter’s 20th goal of the season (assisted by Danny Asmar and Logan Fortune). Mylett made a couple nice saves during a mid-period Bengal power play. River killed off that penalty, but Benedictine broke through with a Matt Carson goal less than a minute after the power play ended. Benedictine goaltender Tristan Cotter made several impressive saves in a second frame that saw the Pirates out-shoot the Bengals, 15-2. Leading 5-1 heading into the third, River was in position to sit back, protect and advance. But Pirate puck-handlers battled on, wisely keeping the action at the Bengal end of the ice. Luke Mallett (power-play goal at 13:42) and Danny Asmar (even-strength at 11:34) scored early third-period goals for Rocky River. When the lead hit six (7-1), the game clock — a running one per tournament rules — became an even bigger enemy of the Benedictine Bengals. The final 11 minutes-and-change rolled into a scoreless exchange up and down the ice. With the 7-1 victory, the Pirates brought an end to a three-game Benedictine win streak. And Rocky River kept alive a streak of its own: the Maroon & White have now held foes to two goals-or-less in seven consecutive games. BENGAL-BEATERS: Thursday’s Baron Cup tilt marked the Pirates’ second meeting with the Bengals this season. River beat Benedictine, 6-1, in the 2018-19 season opener on Nov. 16. The Bucs and Bengals have now met seven times since 2003; River is 7-0 over those seven contests. BRACKET-OLOGY: No. 1 Mentor and No. 4 Hudson advanced in the Baron Cup Playoff brackets on Wednesday. The Cardinals and Explorers will meet in a Saturday semifinal at 5:30 p.m. Rocky River will meet the winner of Thursday’s (8:30 p.m.) No. 3 Kenston-No. 6 Strongsville game in the other semi. That battle will be contested on Saturday at 7:30 p.m. The Baron Cup championship game will be held Sunday at 5:30 p.m. (all games at Brooklyn Recreation Center). YEAR 49 BC: The 2019 tournament marks the 49th Baron Cup; the inaugural tournament was held in 1971. It now represents the GCHSHL’s championship tournaments for the Red, White and Blue Divisions (Baron Cup, Baron Cup II, Baron Cup III). The namesake of the event is derived from the Cleveland Barons, which was the name of Cleveland’s entry in the American Hockey League from 1929-73 and in the National Hockey League from 1976-78. … Rocky River has won a combined eight Baron Cup titles (three Baron Cup, five Baron Cup II). That total ties the Pirates with University School for the second-most in Cup history. Shaker Heights has won a record 12 Baron Cup titles.